Harvard grade inflation: The real problem is admissions. A campus full of straight-A students. 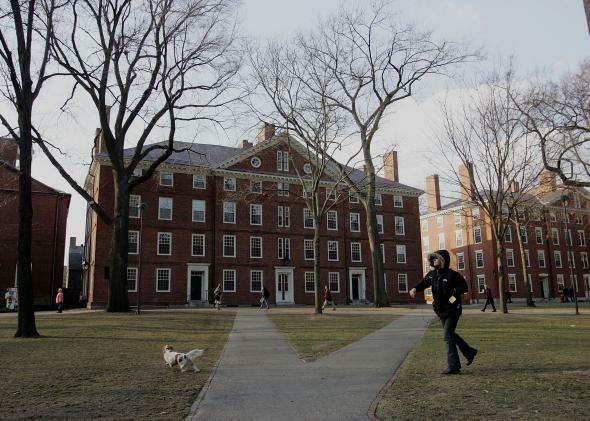 The news that the median grade at Harvard these days is an A-minus has naturally reignited the conversation around “grade inflation” especially at elite colleges. One thing to note about this is that the inflationary dynamic at elite schools is pretty literally a case of inflation. Between 1990 and 2013, the size of the American population has grown 27 percent. The size of the Harvard freshman class has grown about zero percent. As measured by NAEP, the quality of the average American high school student has risen slightly during that period and the size and quality of the international applicant pool has grown enormously. With demand for a fixed supply of slots skyrocketing, you see a lot of inflationary dynamics. University spending per student is much higher at fancy private colleges than it was a generation ago. And it is entirely plausible that the median Harvard student today is as smart as a A-minus Harvard student from a generation ago. After all, the C-minus student of a generation ago would have very little chance of being admitted today. And that, rather than “grade inflation” is the problem. If you go back 40 years ago, nobody was saying “the big problem with Princeton is it’s not exclusive enough.” And yet over time top schools have failed to expand supply. If rich highly selective universities wanted to serve their public missions properly, they would do something like approximately double in size to return to the selectivity of the 1970s. NIMBY issues would probably prevent many (or most) of these schools from literally doubling their current footprint. But mayors of cities that aren’t lucky enough to host world-famous universities know that the presence of one is an enormous asset. If Cambridge won’t let Harvard and MIT double in size, then build expansion campuses in Worcester. I bet Bridgeport and Fall River would love to host Yale II and Brown II. University officials say they’re worried that expansion would dilute the value of their brands, but the message of grade inflation is that the brands have become excessively precious. Double the Ivy League and bring admissions standards down, and I might even reconsider my fatwa against donating to fancy colleges.